I by-and-large agree with the thrust of Jamelle Bouie’s recent American Prospect article, which argues that Republicans badly misapprehend the reason(s) African-Americans generally vote for Democratic candidates. Too many conservatives assert that African-Americans have developed a “false consciousness” and simply need to be shown the error of their ways before they’ll start supporting Republicans. Asking “What’s the matter with black people?” simply isn’t going to get the GOP very far in its minority outreach efforts. If you polled pundits, you’d probably get 90 percent agreement with this statement. And if you polled political scientists, you’d likely get a majority to sign off on it. That’s maddening, because it’s incorrect. I’ve written at length on this, both in my book and here, but it is worth revisiting. In truth, the white South began breaking away from the Democrats in the 1920s, as population centers began to develop in what was being called the “New South” (remember, at the beginning of the 20th century, New Orleans was the only thing approximating what we currently think of as a city in the South). In the 1930s and 1940s, FDR performed worse in the South in every election following his 1932 election. By the mid-1940s, the GOP was winning about a quarter of the Southern vote in presidential elections. But the big breakthrough, to the extent that there was one, came in 1952. 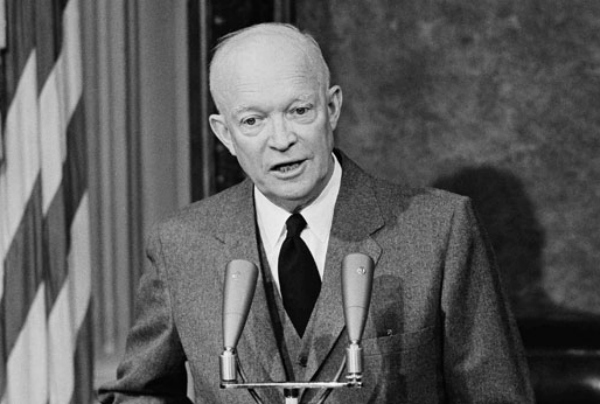 Dwight Eisenhower won 48 percent of the vote there, compared to Adlai Stevenson’s 52 percent. He carried most of the “peripheral South” -- Virginia, Tennessee, Texas and Florida -- and made inroads in the “Deep South,” almost carrying South Carolina and losing North Carolina and Louisiana by single digits. Even in what we might call the “Deepest South” -- Georgia, Alabama, and Mississippi -- Eisenhower kept Stevenson under 70 percent, which might not seem like much until you realize that Tom Dewey got 18 percent in Georgia against FDR in 1944, and that this had been an improvement over Herbert Hoover’s 8 percent in 1932. In 1956, Eisenhower became the first Republican since Reconstruction to win a plurality of the vote in the South, 49.8 percent to 48.9 percent. He once again carried the peripheral South, but also took Louisiana with 53 percent of the vote. He won nearly 40 percent of the vote in Alabama. This is all the more jarring when you realize that the Brown v. Board decision was handed down in the interim, that the administration had appointed the chief justice who wrote the decision, and that the administration had opposed the school board. Nor can we simply write this off to Eisenhower’s celebrity. The GOP was slowly improving its showings at the congressional level as well. It won a special election to a House seat in west Texas in 1950, and began winning urban congressional districts in Texas, North Carolina, Florida and Virginia with regularity beginning in 1952. Perhaps the biggest piece of evidence that something significant was afoot is Richard Nixon’s showing in 1960. He won 46.1 percent of the vote to John F. Kennedy’s 50.5 percent. One can write this off to JFK’s Catholicism, but writing off three elections in a row becomes problematic, especially given the other developments bubbling up at the local level. It’s even more problematic when you consider that JFK had the nation’s most prominent Southerner on the ticket with him. But the biggest problem with the thesis comes when you consider what had been going on in the interim: Two civil rights bills pushed by the Eisenhower administration had cleared Congress, and the administration was pushing forward with the Brown decision, most famously by sending the 101st Airborne Division to Arkansas to assist with the integration of Little Rock Central High School. It’s impossible to separate race and economics completely anywhere in the country, perhaps least of all in the South. But the inescapable truth is that the GOP was making its greatest gains in the South while it was also pushing a pro-civil rights agenda nationally. What was really driving the GOP at this time was economic development. As Southern cities continued to develop and sprout suburbs, Southern exceptionalism was eroded; Southern whites simply became wealthy enough to start voting Republican. In 1964, Barry Goldwater won 49 percent of the vote in the South to Lyndon Johnson’s 52 percent. This doesn’t represent a massive breakthrough; in fact, Goldwater ran somewhat behind Eisenhower’s 1956 showing. He lost Texas, Virginia, Florida, and Tennessee, all four of which were won twice by Eisenhower and the last three of which were won by Nixon. He also lost North Carolina and Arkansas. Goldwater did win Louisiana and South Carolina, although as we saw above, those states became “swing states” in the 1950s, not the 1960s. The only real breakthroughs for Republicans came in Georgia, Alabama and Mississippi (Goldwater won 87 percent of the vote in the latter). But the argument that white Southerners in those states began voting Republican in 1964 is quite a different animal than the much broader claim that white Southerners began voting Republican that year; even then, the groundwork in these largely rural states had been laid in the 1950s. Even at the congressional level, the 1964 elections don’t represent some sort of watershed. The GOP’s development in the South lags its development at the presidential level, as quality candidates continued to favor the Democratic Party well into the 1990s, and as the national Democrats continued to tolerate Southern Democrats operating as a de facto third party through the mid-1970s. But as shown above, it doesn’t start in the 1960s either. But if you're looking for an analogue to Ike's 1952 showing in the South, but at the congressional level, it would probably be 1962, not 1964. The GOP went from winning 21 percent of the Southern vote for Congress in 1960 to winning 33 percent in 1962. It nearly unseated Alabama Sen. Lister Hill that year, leading political scientist Walter Dean Burnham to declare that two-party competition had finally arrived there. Of course, it also won LBJ’s Senate seat in a special election in 1961. Republicans actually stepped backward in the House popular vote in 1964, to 32 percent, before winning 34 percent in 1966. Incidentally, all of these improved showings owe a lot to Eisenhower, who directed the NRCC to launch “Operation Dixie” in the late 1950s, developing local “farm teams” in states where no Republican organization existed and working to make sure more House races were contested. Goldwater’s nomination may well have represented a watershed in the GOP’s ideological development (though I think there are some nuances there that are frequently missed as well), and there’s no doubt, at least in my mind, that GOP candidates used racialized appeals to try to win over Southern whites. None of those debates are impacted by the observations above. But the assertion that white Southerners began voting Republican in 1964 is simply incorrect, whether for president, Congress, or statehouses. The development of the Southern GOP was a slow-moving, gradual process that lasted over a century, and is just being completed today.